Carleton Place is a town in Eastern Ontario, Canada, in Lanark County, about 46 kilometres (29 mi) west of downtown Ottawa. It is located at the crossroads of Highway 15 and Highway 7, halfway between the towns of Perth, Almonte, Smiths Falls, and the nation's capital, Ottawa. The Mississippi River, a tributary of the Ottawa River flows through the town. Mississippi Lake is just upstream by boat, as well as by car. 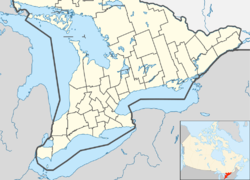 The town is situated on the edge of a large limestone plain, just south of the edge of the Canadian Shield in the deciduous forest ecoregion of North America. Carleton Place was first settled by Europeans when British authorities prompted immigration to Lanark County in the early 19th century. The Morphy and Moore families were among the first to arrive. Edmond Morphy chose the site in 1819 when he realized there was potential in the area waterfall. He built a mill there and was the first of many such textile and lumber industries to reside in the area. The settlement was then known as Morphy's Falls. In 1829, the area was renamed Carleton Place, after a street in Glasgow, Scotland, when a post office was constructed. It became a village in 1870, and a town in 1890. The community's economic growth was enabled by the construction of the Brockville and Ottawa Railway later in the century. The town was also renowned for its access to Mississippi Lake, and had steamship service to Innisville on the west end of Mississippi Lake between the 1860s and 1920s. The logging industry stimulated economic development in the 19th century, with white pine logs exported to Europe. Local forests were depleted of hemlock to provide bark for the leather tanning industry. Both textile and lumber mills flourished, but none still operates. "The Findlay Foundry", founded by David Findlay in 1862, operated until 1974, making cast iron cookware and woodstoves. Some of the designs created by this company are still being made by another company. Today, the remaining mill buildings house condominiums and high-tech industry. The "Crash Position Indicator" (CPI) was manufactured and marketed in Carleton Place by Leigh Instruments Ltd.
Shean Donovan, professional ice hockey player (retired), who last played for the Ottawa Senators. ^ a b "Carleton census profile". 2011 Census of Population. Statistics Canada. Retrieved 2012-02-15. ^ Chisholm, Hugh, ed. (1911). "Carleton Place" . Encyclopædia Britannica (11th ed.). Cambridge University Press. ^ Keddy, P.A. 2008. Earth, Water, Fire: An Ecological Profile of Lanark County. General Store Publishing House, Arnprior. ^ Brown, Howard Morton, 1984. Lanark Legacy, Nineteenth Century Glimpses of on Ontario County. Corporation of the County of Lanark, Perth, Ontario and General Store Publishing House, Renfrew Ontario. ^ a b Brown, Howard Morton, 1984. Lanark Legacy, Nineteenth Century Glimpses of on Ontario County. Corporation of the County of Lanark, Perth, Ontario and General Store Publishing House, Renfrew, Ontario. p. 220-222. ^ Hughson, J.W. and C.C. J. Bond. 1965. Hurling Down the Pine. The Historical Society of the Gatineau, Old Chelsea, Quebec. First edition 1964, Revised second edition 1965. ^ Keddy, C.J. 1993. Forest History of Eastern Ontario. Prepared for the Eastern Ontario Model Forest Group, Kemptville. ^ Brown, Howard Morton, 1984. Lanark Legacy, Nineteenth Century Glimpses of on Ontario County. Corporation of the County of Lanark, Perth, Ontario and General Store Publishing House, Renfrew Ontario. p. 150. ^ IEEE Canada – The Crash Position Indicator. Ieee.ca. Retrieved on 2011-05-13. ^ "2011 Community Profiles". 2011 Canadian Census. Statistics Canada. July 5, 2013. Retrieved 2012-02-15. Wikimedia Commons has media related to Carleton Place, Ontario. This page was last edited on 25 January 2019, at 22:54 (UTC).